Painter and teacher, born in Swaffham, Norfolk. He studied at Woolwich Polytechnic School of Art, 1927-32, with Herbert Buckley, and at the Royal College of Art, 1932-36, under William Rothenstein. 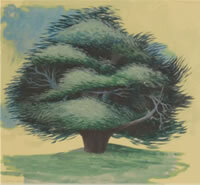 He showed at the RA, NEAC, RBA and in Doncaster, Gateshead and Sunderland. Public collections in Leicester and Wolverhampton hold examples. He lived in Plumstead, southeast London, and later in Keston, Kent. Tempest is typical of a certain kind of British painter: he exhibited year in and year out at the RA and NEAC, thus establishing a solid reputation as a talented landscape artist, and yet today he is little known. He was a competent artist, but also one who was capable of producing exceptional works. 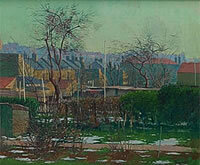 His suburban views of back gardens, which are part of a uniquely English vision, are equal to the works of many of his better-known contemporaries.